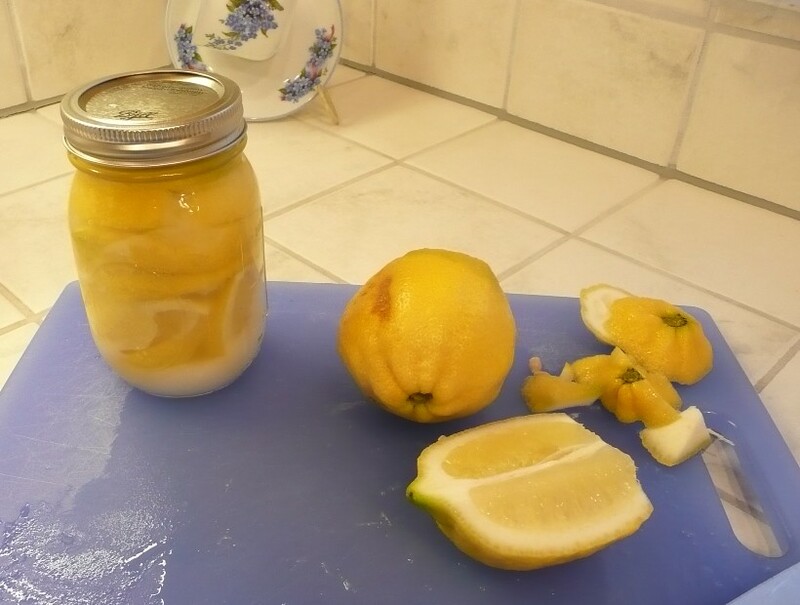 Georgia, my Nia friend on Facebook, shared the recipe she uses to preserve lemons. She said to put them in a jar with salt, let them sit for a month, then use them as you need them. Her instructions stated a quart jar. Well, I don’t have one and have yet to remember to buy one. I really wanted to try this, so I started thinking I didn’t need such a large jar. I might not like it so I decided to start small. So this past week, I smushed some lemons in a jar. I did not do it correctly because I got more involved with cutting and getting them into the jar than actually following the instructions. I did not have the instructions in front of me and I so was just guessing. Of course after I was done I looked them up. First make sure the jar is clean. Then make sure the lemons are clean and dry. Then cut the lemons – not all the way through – in an X pattern. Cutting from one end to the other, leaving one end intact. I did not do that because the lemons were bigger than my jar. So I actually cut the lemons into wedges. Put about two tablespoons of salt in the bottom of the jar. Then put a cut lemon in the jar. Smush it down so the juices come out. Then put more salt, then another lemon – smushing it down, getting more juice. Continue this process until the jar is full. Georgia said you cannot have enough salt. She also said you can add other flavors; herbs, cinnamon sticks, cloves, bay leaf, dried red chili peppers . . . . whatever flavor you would like. 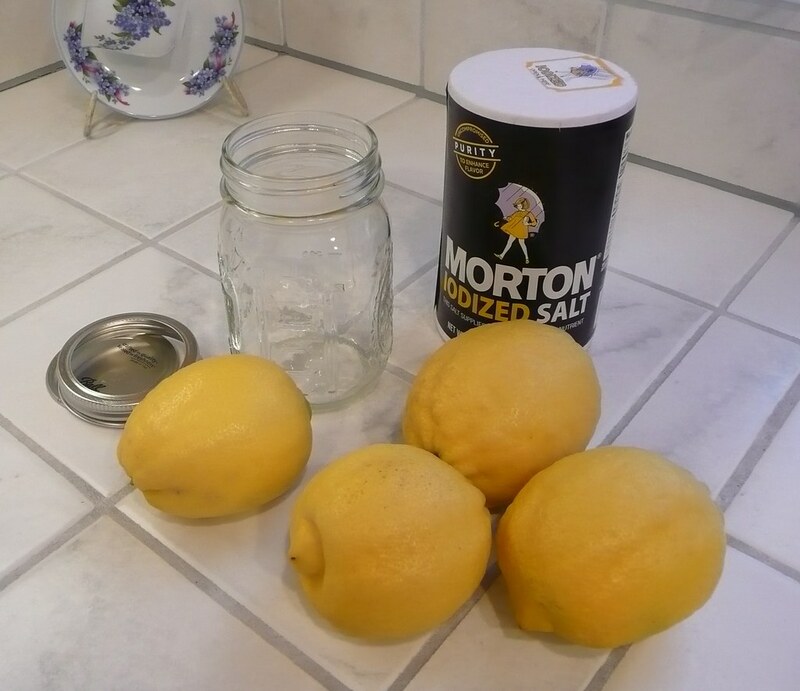 If you need to, put more lemon JUICE in the jar to make certain the lemons are covered. Then you leave the jar on your counter for 30 days. Flipping it over every day. After 30 days you put the jar in your refrigerator and use a lemon or a piece every time you want to flavor something with lemon. Pick what you want out of the jar, rinse it, then use it. You can chopped it up using both the rind and the pulp. Use it with chicken, beef, pork, fish, pasta, salad . . . whatever you want. Her recipe said that you can always add more juice and salt as you use the slices. She said that the sour goes away and an intense yummy lemon flavor comes out. Now . . . . I just did this . . . and by JUST . . . I mean I am in the 30 day flipping stage. So once my 30 days are up you will be reading about it again to see what I think. In looking at her post again she indicated this was a Moroccan delicacy. So I looked it up and there is a lot of information regarding it on the internet. I will post more when I actually get to taste them. Perhaps some of you already do this so you can share? What do you think? When I was first hired on with the Parks and Recreation Department with the City of San Jose, I was a substitute Group Ex Instructor. I didn’t have a class of my own. And we use that term “my class” loosely because we know it is not guaranteed to be a permanent thing and we can be replaced or things can change. But for the sake of simplicity we call them our classes when we are asked to teach a weekly (or more) class at a specific time on a specific day. I didn’t have a class at first. So I was able to fill in as a substitute wherever I could. 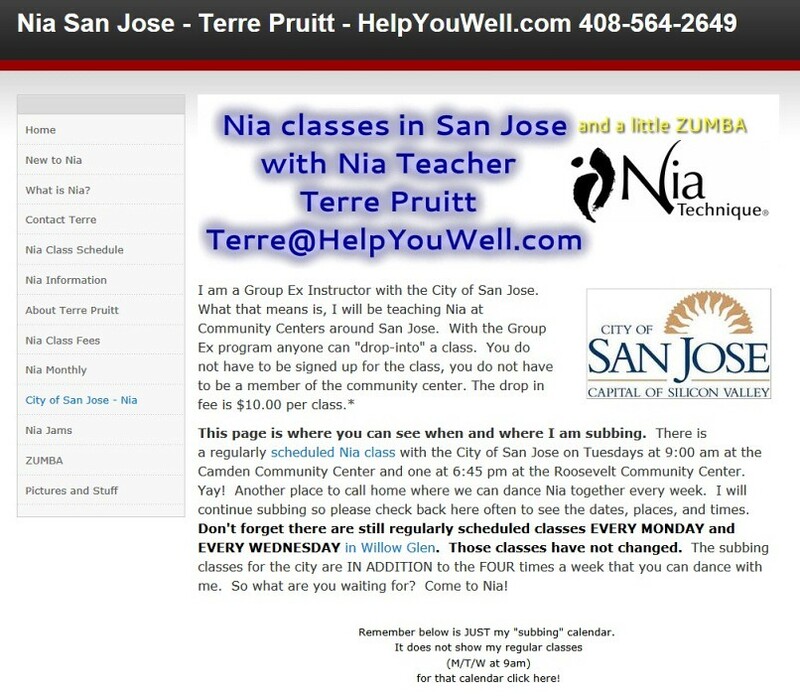 I was also really happy to fill in with Nia because I wanted to introduce the community centers in San Jose to Nia. So I would step up to teach when someone had a cardio class that needed subbing. There are five different community centers that participate in the Group Exercise program. Each center has at least two rooms where they might have a cardio class. Not all rooms have mirrors — and many exercise classes use mirrors. 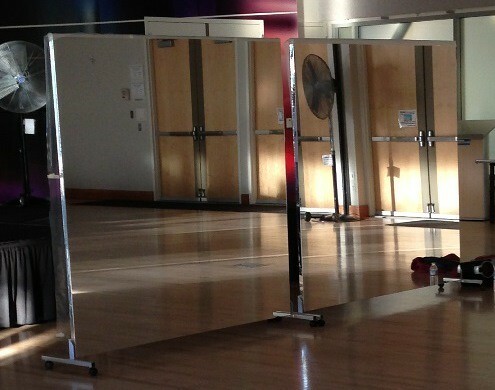 So when I first saw the portable mirrors at a community center I was so excited. These “mirrors” are awesome. It is not like a mirror image it is like a space age image! Have you ever seen these portable mirrors? They are not really mirrors. I don’t know what they are. The material reminds me of the package that toner used to come in. I am not sure how many of you have worked in an office where you had a big copier or printer that used the cartridges that were sealed in the shiny packages. But THAT is what this stuff is like. It is kind of like Mylar. It is REALLY thin. And VERY easily torn. But the reflection when they are new and clean is amazing. 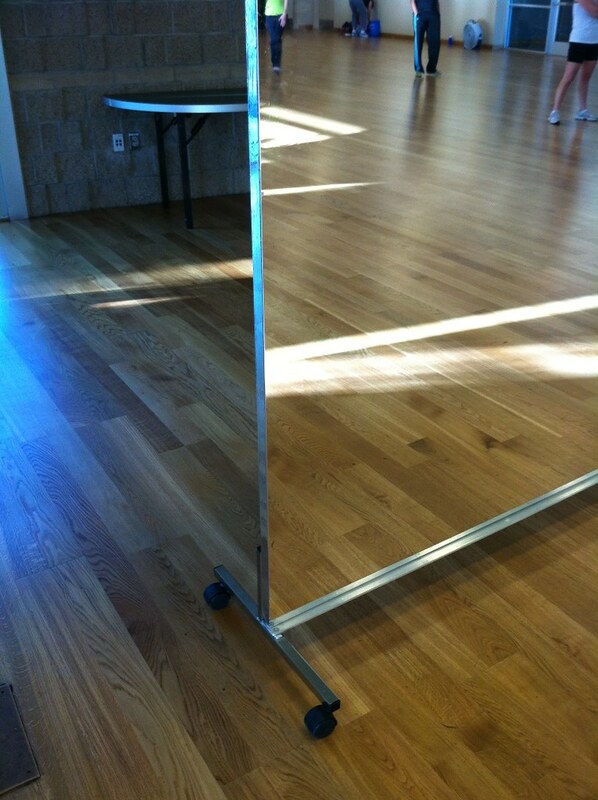 The first time I taught in front of one of these portable mirror things I kept expecting to dance right through to another dimension. Now that might sound odd to some of you, but my husband is a science fiction buff and we watch a lot of science fiction so that is what I felt like because it seem clearer and cleaner and more crisp than a regular reflection. It was more like something otherworldly. It was rather funny because it was so amazing I was distracted a few times. 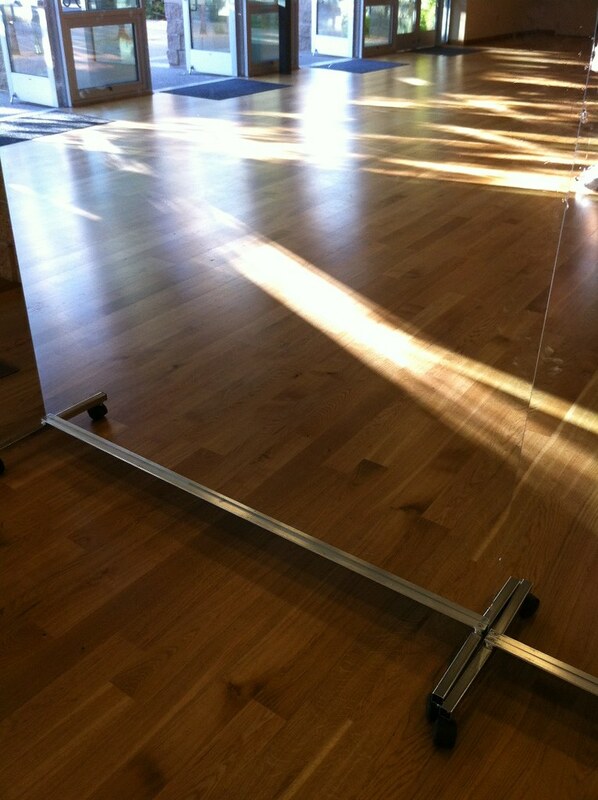 Since these mirrors are not glass they are really lightweight and super easy to move. They are really great for community centers I think. Except I really wish they should come with some sort of handle. There is NO WHERE to hold them without touching the reflective surface. One could get down and use the “feet” to roll them but that is not very efficient nor a good way to be moving (the body). I am always surprised that the city doesn’t simply add something to use to roll them around. It would be so easy to add a strap or SOMETHING so people are not putting their fingers on them or THROUGH them. The reflective surface really is very thin and sadly I have seen many “mirrors” with tears. I just did a quick search and some sites are saying their mirrors ARE Mylar, while others are saying they are not. Either way, they are great lightweight mirrors, but unfortunately they tear easy and I have yet to see any with handles. But when they are not torn and they are clean, they are really fun to dance in front of because it is almost as if you are dancing with a partner instead of your reflection! Have you seen these cool portable mirrors? If you have, do you think they are more clear and crisp than a mirror? In Nia we have this exercise or practice that is really easy yet packs a huge wallop! If you have The Nia Technique it starts on page 11 and is called the Thirteen Joints Exercise. In the back of the book, on pages 252 through 253, it is called the Thirteen Joints Renewal because they are doing it from a squatting position. But basically you move through the same major thirteen joints. This is one of those exercises that can be done fairly quickly, but can really help with the way you move through life. It is basic and easy to do Thirteen Joints Exercise. This exercise focuses on the 13 MAJOR joints in the body. Starting with the left side you simple move your left ankle. I instruct my Nia students to move it in all directions. Think of how this joint is intended to move and move it that way. There is the front back motion and the circling motion. Circle it both ways. I also include in my instructions the encouragement for the person to be comfortable, so if it is comfortable for them to lift their foot off the earth and do the movements then that is the way to move the ankle. Some people are not comfortable balancing on one foot and it is perfectly fine to do the movement with the foot on the ground. 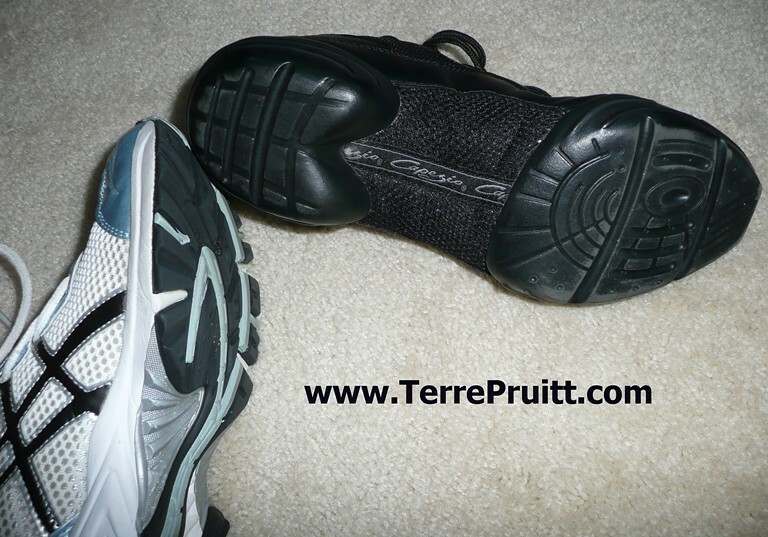 The toe can be on the ground to stabilize and then the heel. The ankle can get the same type of circular motion with the foot on the ground. However it is comfortable is how you should move it. The left ankle is joint one. Then traveling up the left side we come to joint two, the left knee. Again, thinking about how this joint is intended to move allows us to move it in a way that is comfortable and beneficial. Allowing the calf to swing forward and back. 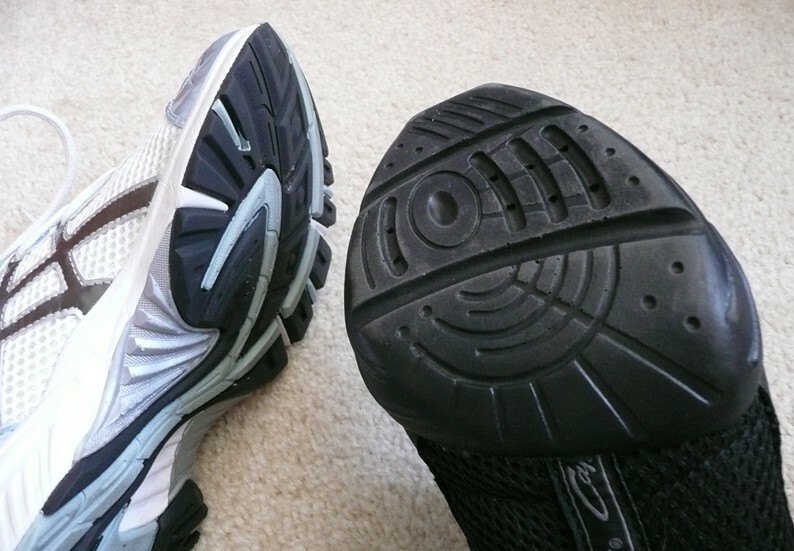 Or if you want to keep your foot on the ground then you can lower yourself down on the left side as low as is comfortable and come up again. This gets that joint moving. Next is the left hip. For this hip joint we move the left thigh. For the person that is balancing on the right leg the left thigh can come up and be pressed back. The thigh can circle. If your foot is on the earth you can bend forward. This affects the hip joint. You can also “knock” your left knee, allowing it to go in and out. Bumping the left hip gets some joint action going, too. This joint is three. Then we go to the left wrist. Move that hand all over. Flex it, extend it, wave it, circle it, just move, move, move it! Use your fingers to get more wrist action! This is our fourth joint. Move up to the elbow. Your left elbow is the fifth joint in our Thirteen Joints Exercise. Swing that forearm around and move it all over. We are still going up, so the next joint, the sixth joint, is the left shoulder. Here you can shrug, you can circle, you can push it back and forth and to ensure joint action you want to use the arm. Move the arm. Circle the arm, move it forward and back, lift it the arm, lower the arm, swing the arm back. Really get that arm moving to experience the action that was intended for that joint. Now our seventh joint is really a group, it is not just one spot. The seventh “joint” is our spine. There are a lot of ways to move the spine. As with ALL the movement we do in Nia, it is important that you keep in mind your own body’s way and move your body as it is comfortable. The spine is put together so it can move in many ways, but there are many things that keep people from moving the way it was designed, so keep your own body’s way in mind as you move your spine. My instructions include looking left and right, up and down, rolling the head, bending forward and back, bending to the sides, circling around, rolling up, and rolling down . . . again, any way the body can comfortably move. Now we are on the right side. We go down the right side of the body moving each joint as we did the left side. Now, of course, it might not be exactly the same, but I imagine you know what I mean. The right shoulder is joint eight. The right elbow is joint nine. The right wrist is joint ten. The right hip is joint eleven. The right knee is joint twelve. The right ankle is joint thirteen. Moving the joints helps keep them flexible and mobile. This exercise can also help with drawing attention to areas that might be tight or stiff. This practice can be done in as little as one minute. As I just mentioned it could help make you realize there are areas that might need or want more attention so how long you spend on this is up to you. So, how do you feel after doing this exercise? I have students who come to Nia that amaze and inspire me. After Nia class recently I saw someone walk out of class I wish I had talked to before they left. But they left before I could make it over to them. But then when I left they were still outside. It was a new student so I was so happy to be able to say hello and get their name. I realized later that I didn’t introduce myself, but at least I got their name. Anyway, we were talking about their participation in Nia and they shared one of the reasons why. It reminded me that exercise is a great way to help against depression. There are studies and research that go a long way in proving that exercise does the body good when combating depression. This is the Holiday season and some people get depressed. So getting up and moving is a great way to keep the blues at bay. I was so happy to hear this student being proactive and not letting the circumstances that have been presented get them down. Exercise increases the production of endorphins, it also DECREASES stress hormones. So TWO things working at once. The decrease in stress hormones AND the increase in endorphins. Endorphins are the chemicals that make you feel good. So exercise makes you feel good. Endorphins also act as natural pain killers working to mask pain. Sometimes pain is a symptom of depression so in addition to just feeling good you are not in pain — two ways you are feeling good. According to WebMD, one study — way back in 2005 — revealed that “30 minutes of moderately intense exercise five days a week reduced symptoms of depression by nearly half after 12 weeks”. This study was done at the University of Texas Southwestern Medical Center. Science Daily has a little article about how it is now believed that not only is exercise an effective way to treat depression it is also being considered as a way to prevent depression. Seems to me like that would be a given considering all the benefits one can receive from exercise. I mean, in addition to all the chemical reactions in the body you just have better stamina and/or mobility and/or strength and/or stability. There is debate about what type of exercise, but what I am seeing is that it needs to affect the body . . . either get your heart pumping or your muscles changing. Both is fine too. It does not have to be extremely strenuous, but there should be a level of intensity that is not attained during your regular activities. I would go out on a limb and say that most of us know exercise makes us feel better. I don’t think we need to read the studies that the researchers are writing. We have done it ourselves and KNOW without a doubt that working out makes us happy. I think that it helps even more if the workout is something you enjoy. But even if you are “doing time” on a treadmill it is better than sitting around. So, again, I am so happily amazed by my students. Often times the first thing that gets cut from a schedule when it starts to get busy is exercise. Don’t let that fall off your calendar. What about you? Are you getting some exercise in? What type of exercise makes you happy?